Published today, a focus on Sekt, Germany’s sparkling wine. Including Jamie and Treve’s Sekt Tape. This in-depth focus on Sekt is a collaborative effort. Canadian wine journalist Treve Ring and I have crossed paths around the globe with a joint goal to visit wine regions and tell their stories in a fresh way, making full use of social media, words, pictures and video. While both of us could have done a pretty good job of this alone, working as a team has its advantages. When two serious (geeky) journalists visit a producer, the dynamic of the interaction is changed. Each journalist asks different questions and this makes the interviews richer and more productive. Doing video is a lot easier when there are two of you. And when it comes to producing content, then two perspectives can often help produce a more complete story. I also like the idea of having two sets of tasting notes to compare; in some ways, this is fairer to the wines. The Sekt Tape and its associated write-ups are the first in a series of these collaborations. We have pieces from Douro and Bordeaux to follow, and we have a series of adventures lined up for 2017. Some of the videos are short, just a few minutes long, while others like Sekt are more involved. All of our projects are meant to be accessible, unpretentious and authentic – much like the producers and wines we want to share. Sekt was a good place to start our collaboration. We both love sparkling wine, and this is a story that hasn’t been told properly before. Germans drink a quarter of the world’s production of sparkling wine, and a lot of it is Sekt. But Sekt is most often a low-grade industrial product. This wasn’t always the case: back in the 19th Century, Sekt was very important, and Germans were instrumental in establishing some of the leading Champagne houses. 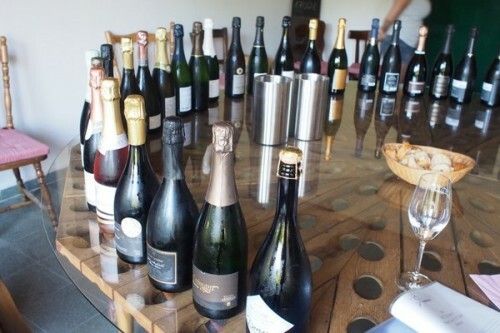 We went on the trail of interesting, high quality, traditional method Sekt, and found quite a bit to communicate. You can read all about our Sekt adventures here. looking forward to seeing a lot more. On a personal note regarding the video. I guess you, Jamie, are in this wine thang for the long hall and i can’t help thinking that the sight of you aged 70 dressed in that check shirt will be deeply embarrassing! It’s becoming your ‘trade dress’, and pretty soon your fans will expect it. Nice post, loved reading it.